As you read music, you'll start to notice that you'll encounter patterns and written music that you already know how to play. So now all you have to do is figure out how to quickly link the notation to something you can already do. Let's talk about reading chords. A stack of notes on consecutive lines or spaces is really a stack of thirds. 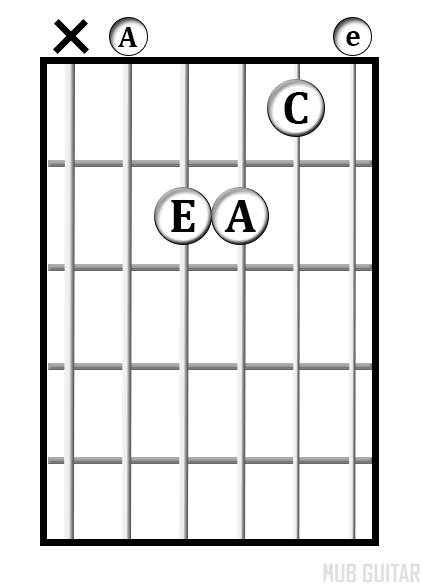 And a stack of thirds is a closed position triad, usually a major or minor chord. If you take the lowest note in that stack of thirds and put it on top, you've got a chord in its first inversion. It has the appearance of a third with a fourth on top. So the first chord is a stack of thirds C major, second chord, a third with a fourth. The shape itself looks like the stack of thirds but with a small gap between the top two notes. If you repeat that, now the gap is between the bottom two notes, and the chord is in its second inversion. Music that appears to be a melody may also sometimes be nothing more than the notes of the chord. So it helps to be able to look across a measure or two and visualize what chords might be formed when all of the notes are combined. As you get more experience with sight reading, you'll start to recognize many of the patterns that you already know how to play. You'll also be able to look ahead in the music by one or two measures, combining what you see there to find if there are any chord shapes that can be used to play the pattern. While sight-reading, many structures will be encountered. Some are so basic that they form the core of the musical universe. The advanced player will instantly recognize them, greatly simplifying the process of sight-reading. The beginning sight reader should trust that knowledge of these patterns comes in time. Chord patterns, both horizontal (chords played melodically, as an arpeggio) and vertical (chords with notes played in harmony together) are recognizable over time. The study of how chords are built is beyond the scope of this lesson, but we’ll see a few examples. In the first measure of the example is a root position C major chord. Whenever the sight-reader sees a structure on three consecutive lines or three consecutive spaces, they will recognize a triad (basic chord). Knowing how to play these triads on the guitar, it is easier to play the C major triad than it is to think of the notes individually and try to fit them together. Of course, playing more than one note at a time also means playing more than one string at a time, meaning the sight reader also has to plan the placement of notes to line up on three different strings. In the second measure is a chord called a first-inversion chord. This just means you take the chord in the first measure, grab that “C” on the bottom, and stick it on top instead. If you haven’t learned inversions yet, don’t worry too much about it—yet. All of the structures you learn to play on the guitar also can be notated, and reading notation will be much easier when you can quickly recognize a notated structure that you already know how to play. You may not always know you’re looking at a chord. Sometimes it comes in disguised form. At first glance, the above example appears to be an ordinary melody. But after playing it, you might notice that it has the notes of the familiar Amin chord. Over time, as you learn to scan your eyes across the page in advance, you’ll develop the skill of looking ahead as you play, and recognizing structures formed by the notes of multiple measures. This will help you to choose better methods. In this case, an advanced reader would probably quickly fret the whole A- chord, and then simply move the pick across the strings with the correct rhythm. Much easier than trying to figure out every note. If a chord is clearly being written in the melody, it may not be clear whether the composer intends for the notes to have the exact value as written, or if some of them will be longer. In the example above, each note could receive its literal length, or they could accumulate to a spread-out arpeggio. Since the latter is harder to notate, a composer may write it the simple way and expect the player to figure it out. However, a composer may also use other methods to indicate how the notes should be interpreted. 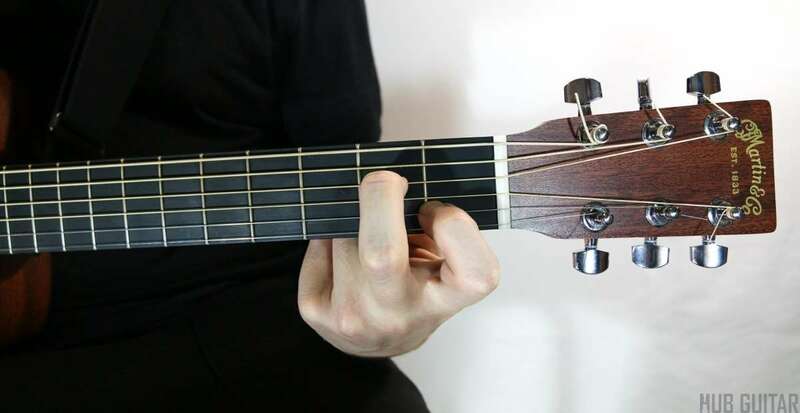 Although a bit complicated, this is technically the correct way to get across the message that the chord is arpeggiated and its notes are allowed to ring. This indicates that the notes are cut short (shorter, actually, than their written amount). A tenutoA tenuto is a flat horizontal line written above a notehead to indicate that note should be given its exact literal amount, not longer and not shorter. could also be used. In any case, specificity of this kind is not always given. Can you see the chord here? Chord patterns can often be found, even when they are not completely obvious. This example is best played by fretting an open Cmaj chord. The finger fretting the high “C” will lift up to play the “B”.